This résumé template has just a touch of retro - its titles are in the Bauhaus 93 font and it uses a 70s orange colour for the headers and border. The body text uses Calibri, a smart, neat font that is a great choice for presenting information - and this could easily be replaced with Arial if you prefer. 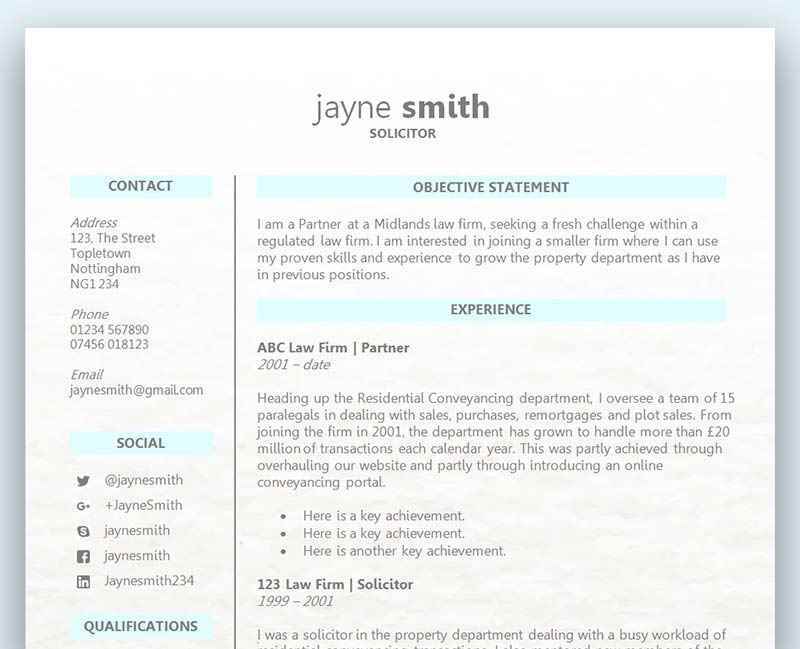 Aside from the retro headings, the rest of the template is quite normal in style - neat alignment, simple bullets, clean lines and subtle use of secondary colours make this layout professional and suitable for many different career choices. Retro orange CV/résumé template	Overall rating:	4.5	out of 5 based on 2	reviews. Smart and clean with just a touch of classy retro styling to add a little interest to your résumé. The familiar seventies orange keeps the layout interesting without being unprofessional and the well thought out design details help you present your information in an attractive way. Before you download your template, check the description and make sure you have any required font installed. If there’s a font you need, install it first before opening the file so everything looks as it should. Usually this is just a case of downloading a tff file and double clicking on it – you’ll then see a preview of the font and a button to install. Underestimating the impact a cover letter can have is a huge mistake. A covering letter allows you the opportunity to speak more freely and directly to the hiring manager, making them aware of what you can bring to the role. A cover letter is not meant to repeat what you’ve already put down in your CV. The cover letter allows you to add additional details that you weren’t able to properly explain on your CV. The cover letter can allow you to tell more of a story that your bullet pointed CV couldn’t, and gives you the opportunity to expand on anything you feel the employer should be made aware of. You should never draw the employer’s attention to anything you can’t do, and instead you should always focus your cover letter on what you can do and what you can bring to the role. It’s often the case that a job seeker isn’t able to completely tick the boxes on every single skill and qualification stated on the job advert, but that doesn’t mean to say it should hold you back. Use the cover letter to showcase what you can bring to the role and never worry about anything you feel you are lacking. If you are confident you would perform great in the role, then that’s what needs to come through on your CV and cover letter. Here’s further information on How to effectively utilise your work experience on your CV. There are often times when a cover letter can be less formal than the CV, and in a lot of cases a friendlier more open approach works very well. Remember, a cover letter can contain absolutely anything you want, as there are no sections or restrictions like a CV offers. A generic covering letter is as bad as a generic CV! You should always tailor your CV and complete application to the position, and this also includes your cover letter. Avoid all generic statements like, ‘To the Hiring Manager, I am extremely excited to be applying for the role you have currently available, where I hope to be able to showcase my skills and experience with your company’. This type of approach will put the reader off instantly, as it won’t be the first time that day that they’ve seen a generic application. Make yours unique and purposeful, ensuring the reader knows that you have put in the effort to research the role and the company. The position is important to the company, so make them away it’s important to you too. Remember, this is a letter to the hiring manager to explain why you are the right person for the job and what you can bring to the company. It should be less formal than your CV, cover more details and introduce your application. Half a page to one page is more than enough, as you don’t want to bore the reader before they’ve even gotten to your CV! If you liked our article please also visit – Is a cover letter essential for your CV?